In 1947 Elia Kazan created The Actor’s Studio, the most important and influential school for thespians America has ever known. The workshops taught “The Method” style of acting which would transform the medium, particularly on film, bringing about an unrivaled sense of realism to what had once been, even at its best, more of a stilted and mannered approach. Kazan himself had been an actor, studying at Yale’s School Of Drama before joining the prestigious Group Theater, yet soon found that his greater talent was not in performing but rather in molding the performances of others. He’d go on to be one of the 20th Century’s most acclaimed directors and the list of his great films, like the roll call of legendary performers who learned their craft at his Actor’s Studio, is truly staggering. Dave Bartholomew was the Elia Kazan of rock ‘n’ roll. Like his contemporary in the film medium Bartholomew was a performer who found his calling overseeing the work of other artists, writing and arranging their songs, producing their records, shaping their sounds and making them stars. He was the first “modern” music producer much as Kazan, it could be argued, was the first “modern” film director. Kazan embraced a new approach, one emphasizing a realism with characters performances drawn from each actor’s own inner self. 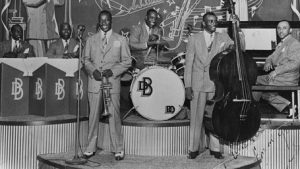 Bartholomew performed a similar task in the recording studio, subjugating his own Dixieland jazz interests for a style that was appropriate for both the artists and the era itself. In the process he, more than any behind the scenes figure of rock’s first 15 years, shaped what rock ‘n’ roll soon became and allowed the music – and the artists he guided – to reach their full potential. The cost of this undertaking though was in many ways his own recording career. 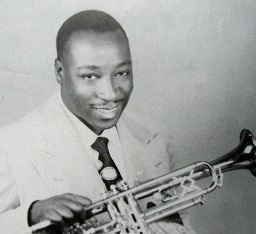 Dave Bartholomew was born in 1920 in Edgard, Louisiana where his father was a musician who ran a barbershop on the side. Already showing an affinity for music at an early age Dave’s enthusiasm impressed an older man getting his hair cut at his father’s shop. That man was Peter Davis who had taught Louis Armstrong as a boy and now offered to teach young Dave as well. By the time he was a teen Bartholomew began playing in local jazz bands and was touring extensively at just 16 years old. After a stint in Fats Pichon’s band, including leading it for a time on one of the Mississippi steamboats when Pichon took up residency back home in New Orleans, Bartholomew was offered a job in 1942 with Jimmie Lunceford’s band, the inventor of swing and an avowed idol of the budding young musician, but soon after Bartholomew was drafted into Army. Though the war took him out of his dream job it perhaps turned out to be a blessing in disguise as due to his musical ability he spent World War Two traveling with his trumpet rather than a gun, playing at bases all over the world, including once for General Eisenhower. It was also while he was enlisted that an older serviceman taught him music composition as well as how to arrange, skills which put him a step above most musicians when he returned to civilian life in 1946. Initially intending to continue with his distinctly New Orleans styled jazz leanings when he got back home Bartholomew soon got caught up in the emerging sounds that had begun around the Crescent City following the war and found himself drafted into the budding rock scene as it were. At this time he formed what would be the core of the great studio band that just a few years later would utterly transform music forever, building much of rock ‘n’ roll’s foundation in the process with the likes of Red Tyler and Earl Palmer. According to everyone around town Bartholomew’s band was the hottest on the scene throughout 1947, popular enough to secure a radio show every Sunday night as well as backing whoever around town needed a crack unit for a gig. That summer, when DeLuxe Records came to town – having already snatched up Paul Gayten and then Roy Brown – it didn’t take them long to sign up Dave to cut his first sides in September 1947 which is how we come to be introduced to him here. Jazz reared though he may be it’s telling that half of what they laid down was already squarely in the burgeoning style of rock. Roy Brown’s seminal Good Rocking Tonight had come out the same month Bartholomew cut his first session and was already widely heard in New Orleans so it’s certainly likely that its influence crept in. Or it could just be that the music of that time and in that place was leaning towards rock anyway, as evidenced by earlier cuts by New Orleans stalwart Paul Gayten, and it’s very likely that by playing around the city as much he did Bartholomew had picked up on it quite naturally without any pre-conceived commercial intent. Despite this it’s also pretty obvious that they were sort of casting about for different sounds in the hopes that one of them – ANY of them – would connect. New Orleans music was always an intriguing gumbo dish to begin with, featuring some jazz, some blues, some romping rhythm, all thrown in the pot together to simmer. It shouldn’t be at all surprising that when Bartholomew dipped the ladle in to dish some out on the plate he got a little bit of everything and just hoped that something in there tasted good to whoever sampled it. Their jazzy version of the moldy pop chestnut Stardust was issued as the A-side of his debut and is pretty standard lightweight fare, albeit with Dave’s adventurish trumpet dominating. Regardless of your impressions of that rendition, good or bad, it was something that would come and go without much notice. In other words, it didn’t stand out in any field. But She’s Got Great Big Eyes was something else entirely. Or – to put it more succinctly – this sure as hell wasn’t jazz! It kicks off with Fred Lands pounding piano figure before Dave leads the vocal chorus which makes up the bulk of the lyrics which are sung/shouted by the crew over the propulsive rhythm. Bartholomew takes the verse, such as it is, solo, but the record is really dominated by the instruments. Lands’ piano carries the load the first half before the saxophone takes over. Bartholomew’s trumpet takes the third section and sounds like a swarm of bees has attacked in formation, buzzing frantically in the speakers. The excitement generated on this is apparent and showed Bartholomew already grasped the importance of how to highlight different aspects of the arrangement and keep the whole thing lurching forward, never letting up on the pedal. Ultimately though, for all its enthusiasm there’s not much of a song to be found within. It was, in essence, a glorified jam session and a somewhat crude one at that. Though skilled at arranging he hadn’t yet seemed to master song construction. Notably the lyrics never made another appearance following that initial stanza and so there’s no framework to return to once the instruments take off into orbit which would’ve helped the record have a more definitive feel. Instead it sounds like something that would likely go over well at the end of a long night in the French Quarter when the patrons were sloshed and would gladly hand over their last dollar for a feverish performance from the bandstand that would allow them to let loose one more time before staggering out into the steamy humid air. In that setting this would undoubtedly work better but as records go, something to listen to without the rowdy frivolity contributing to the atmosphere, it falls short. Intriguing for sure, but not compelling. But that’s probably not the worst thing that could’ve happened. He was still two years away from Lew Chudd offering him the chance to produce for Imperial Records which is of course how he’d eventually secure his legend. 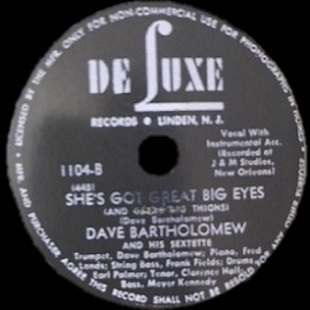 Had Bartholomew scored big on his own in the interim it’s doubtful he’d have still been available to even listen to such an offer and thus the careers of Fats Domino and hordes of others may never have gotten off the ground and the course of popular music would’ve been irrevocably altered. The two years spent woodshedding, honing their chops, crafting their sound and fine-tuning their approach may have seemed to be a bitter pill for the proud and ambitiously talented Bartholomew to swallow at the time but it was the exact prescription he needed to fulfill that ambition and change the world. Even Elia Kazan didn’t win an Oscar his first time out. Leave a reply on "Dave Bartholomew: “She’s Got Great Big Eyes”"